New England Patriots head coach Bill Belichick says his side have followed "every rule to the letter" and accept no blame in the "Deflate-gate" saga. An NFL investigation found 11 of the Patriots balls were underinflated during their AFC Championship game win against the Indianapolis Colts. Deflating a ball in certain conditions provides more grip for the quarterback. Belichick told a news conference: "I believe 100% that we have absolutely followed every rule to the letter." The 45-7 victory over the Colts effectively earned the Patriots a place in Super Bowl XLIX on 1 February against the Seattle Seahawks. But the balls used by Belichick's side in the opening half of the last Sunday's game were below regulation pressure limits. An NFL statement released on Friday did not say whether the under-inflation was intentional, but confirmed that the balls used in the second half were "properly inflated". 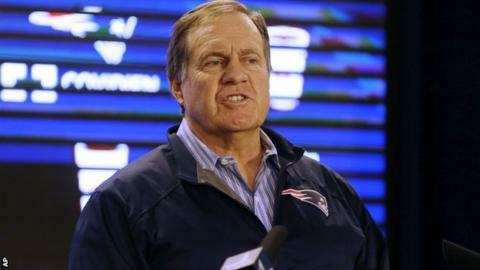 "At no time was there any intent - whatsoever - to try and compromise the integrity of the game," Belichick said. "Patriots quarterback Tom Brady could have been throwing beach balls and it wouldn't have made a difference because there was such a gap between the two teams." "At no time were any of our footballs prepared anywhere other than in the locker room or in an area very close to that. "Never in a heated room - that has absolutely never taken place to anyone's knowledge or to anyone's recollection. That just didn't happen." Prior to Saturday's press conference, both Belichick and Patriots quarterback Tom Brady had denied any involvement in the saga. "The integrity of the game is very important. I have always played within the rules," three-time Super Bowl winner Brady said. "I don't like the fact that this has taken away from some of the accomplishment of what we have achieved as a team." If found guilty, the Foxborough-based franchise face a fine and could lose a draft pick. #Deflategate: Is it really cheating? Read more on #Deflategate is all over the internet but why the fuss?